Ardamax Keylogger is a small, easy-to-use keylogger that captures user activity and saves it to a logfile. Ardamax Keylogger's logfile can be viewed as a text or web page. Use Ardamax Keylogger to find out what is happening on your computer while you're away, maintain a backup of your typed data automatically or use Ardamax Keylogger to monitor your kids. Ardamax Keylogger will run in hidden mode, preventing users from knowing it is active. 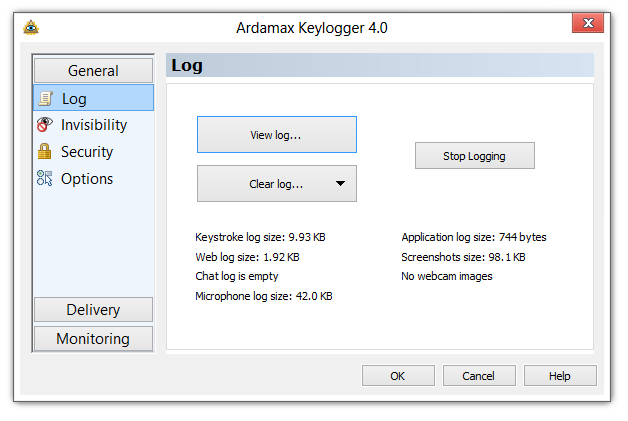 Captures user activity and keystrokes into a log file with Ardamax Keylogger. ...... It will NOT show in the Uninstall list, the Task Manager, or the Application menu! This feature makes Ardamax Keylogger absolutely invisible to everyone! * Keystroke monitoring - Track all keystrokes pressed. If a keystroke is pressed, Ardamax Keylogger will secretly record it and save it to a hidden log file for you to view at a later date. * Email log delivery - Ardamax Keylogger can send your recorded logs via e-mail at set times - perfect for remote monitoring! * Application tracking - Ardamax Keylogger makes it easy for you to find out where exactly a keystroke was pressed. Whenever a keystroke is typed, Ardamax Keylogger will record the application that was in use that received the keystroke! Qweas is providing links to Ardamax Keylogger 4.0 as a courtesy, and makes no representations regarding Ardamax Keylogger or any other applications or any information related thereto. Any questions, complaints or claims regarding this application Ardamax Keylogger 4.0 must be directed to the appropriate software vendor. You may click the publisher link of Ardamax Keylogger on the top of this page to get more details about the vendor.